It’s always so nice to finally push off and be on the water. Within minutes you are away from the distractions of life, and all you have to do is worry about paddling straight. 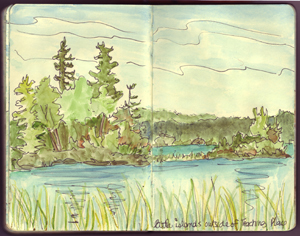 Join me in my artwanderings on this canoe trip through Quetico Provincial Park in Ontario, Canada. 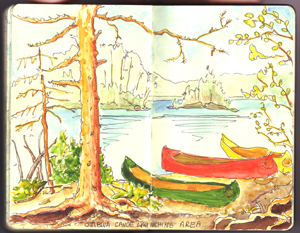 Always start the trip by getting ready to launch your canoes… and take some time for sketching along the shores of the lake.